Food Sovereignty Ghana (FSG) and hundreds of concerned Ghanaians and a good representation of foreigners will congregate in the La Township of Accra Ghana on Saturday May 20th to observe in solidarity with hundreds of thousands around the world, the annual March Against Monsanto. This is the fourth consecutive March observed by FSG in Ghana. Monsanto is well known for its irresponsible and controversial corporate practices and it is no wonder that there is so much international consensus across the planet on the need to bring justice to the many issues that infringe upon the rights of individuals, groups and entire nations across the globe. The poisonous glyphosate based flagship chemical “Round Up” sold by Monsanto has found its way into most African countries including Ghana and the overwhelming evidence exposing the carcinogenic nature of the chemical has sadly not registered as fact with our local policy makers. The findings of the recent Monsanto Tribunal provide enough evidence to make the informed decision to keep Ghana organic however these calls seem to perpetually fall on deaf ears. With the nation’s recent rude awakening to the real impact of galamsey (illegal small scale mining) activities and the consequent implications on human health and the environment, FSG seeks to use the March to send a clear message to key stakeholders of an impending disaster of national dimensions in the coming years if there is not a dynamic shift away from large scale commercial agriculture with its heavy dependence on energy and chemical inputs. A recent documentary by Joy news also exposes the rampant misuse of chemicals in our food production systems and therefore it is high time we pay heed to this unsustainable way forward in our agriculture. The cost to human health and the environment is too high to bear hence the principled position that FSG has taken ever since its inception in 2013. A court in California recently ruled on a case involving the controversial glyphosate based chemicals and has ordered all products containing the carcinogenic ingredient to have a mandatory label warning potential consumers of the high risk of cancer. The financial power behind the corporate lobbying for Monsanto results in decisions and policies implemented in countries across the world which do not endure to the benefit of the local population. Directly impacted are the often majority of the population being the peasant farmers. March Against Monsanto, is an international grassroots movement against Monsanto corporation, in protest of the company’s practices of using their affluence to influence the outcome of legislations, regulations, research findings, media narratives, etc. The movement was founded by Tami Canal in response to the failure of California Proposition 37, a ballot initiative which would have required labeling food products made from GMOs. Monsanto was reported to have poured in $7,100,500 to help narrowly defeat California’s Proposition 37. Since the huge success of the first march, the movement has been growing from strength to strength and a larger number of cities and countries are expected this year. Why do we march in Accra? This year’s march comes at a time where Parliament is reopening with the Plant Breeders’ Bill still compliant to the International Union for the Protection of New Varieties of Plants UPOV, a rather rigid set of intellectual property rights regime that is not suited to our socio-economic conditions. This UPOV-compliant Plant Breeders’ Bill, aka “Monsanto Law”, is on its agenda. What is at stake is the farmer’s right “to save, use, exchange and sell farm-saved seed and other propagating material”. The bill in Clause 21 (2), puts farmers’ rights at the discretion of the Minister for Agriculture, which equates to not rights at all. The same bill in Clause 23, makes the rights of the plant breeder independent of the laws of Ghana. Despite several calls for a report on the almost four-year old “consultations” by respective Parliamentary Select-Committee responsible, we are yet to receive any favourable response. The absence of the report makes the entire process an affront to the sensibilities of Ghanaians. The public has an interest to know what petitions were presented, their full content, and why the Committee in its wisdom is proceeding, in the light of these objections. It is difficult to see how Parliament is going to proceed with the consideration of the Plant Breeders’ Bill without the publication of such a comprehensive report. This shall be in contravention of the call for “further consultation” by the Speaker, “because it is important to inform the people of Ghana”. It is a pleasure to be part of what has become the most powerful statement of the ordinary person in the street against the deep pockets of giant lobbies, promoting GMOs, facilitating biopiracy, suppressing farmers’ rights, and other mischiefs. We are marching to protest the continued imposition of GMOs on Ghanaians by our political class, aided and abetted by scientists blinded often by conflicts of interests and inducements from the GM lobby. Meanwhile, if anything at all, the spectacular failure of Bt cotton in Burkina Faso should be a good reason why Ghana must be considering other agroecological solutions rather than the failed technology that impoverishes farmers and enriches the seed corporations. We are marching to highlight the need to learn the appropriate lessons from the international environment under which the march is taking place this year. The recent leaks of the proposed Transatlantic Trade and Investment Partnership (TTIP) have added a new sense of urgency and the importance of the march. We take note that the thrust of the agreements is to enhance corporate power through legal mechanisms. The Panama Papers give us some ideas with what they do with the money they steal from us! As this march takes place at a time the Parliament of Ghana is reopening with the Plant Breeders’ Bill at the top of its agenda, we call on Parliament to completely withdraw the UPOV-compliant Plant Breeders’ Bill and replace it with a “sui generis” plant variety protection (PVP) system suitable to our conditions. We strongly believe that it is about time that our Parliament shifts the discussion on the controversial and immensely dangerous UPOV-compliant Plant Breeders’ Bill to a focus on a “sui generis” PVP system for Ghana. We have already pointed out that Ghana is a member of the World Trade Organization and the rights and obligations concerning intellectual property are governed by the WTO Agreement on Trade Related Aspects of Intellectual Property Rights (TRIPS Agreement). According to Article 27.3(b) of the TRIPS Agreement, Ghana has to provide protection of plant varieties by an “effective sui generis” system. Under this, Ghana has full flexibility to develop an effective “sui generis” system for plant variety protection, i.e. to develop a unique system that suits its needs. There is no need for Ghana to allow our laws dictated to us from an organisation like UPOV in Geneva. 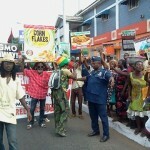 We call for an indefinite moratorium or complete ban on the cultivation of GM crops in Ghana until the science of GM foods and human health, as well as environmental impact, has been thoroughly studied and cleared as safe by independent science rather than corporate-driven, profit-oriented scientists and regulators, ridden with conflicts-of-interest. We humbly call on the Nana Akufo Addo administration to orientate government policy on agriculture towards what all the experts are saying: agroecology. The technology currently exists that is developing drought-resistant, pest resistant and high yielding crops through traditional breeding and selection. Marker Assisted Agro-ecological farming is not only inexpensive, and sustainable, it is far more successful than GM technology. Agroecological techniques are already safely and inexpensively producing crops with increasing yields plus tolerance and resistance to environmental stressors. We should forget GMOs and concentrate on agroecological agriculture. The only reason why our “development partners” are opposed to this is because their multinational corporations shall lose the attempts to monopolize our food through GMO patents. They see our agricultural wealth as raw material to be extracted from Ghana in order to power their economic engine. We need to control and develop our agricultural wealth to power Ghana’s economic engine. That’s why we invite all to join us as we March Against Monsanto here in Accra.